Notice and agenda filed in the office of the City Clerk and posted at City Hall at 11:00 a.m. on Thursday, May 17, 2012. A. Approval of May # 2 Payroll in the amount of $40,225.59. B. Approval of Claims in the amount of $24,734.85. C. Approval of Minutes from May 7, 2012 Regular Meeting. D. Approval of Budget Supplemental in the amount of $20,000 for FEMA reimbursement. 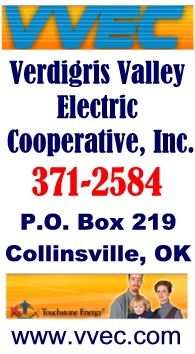 E. Approval of agreement between Cox Oklahoma Telecom, LLC and City of Collinsville. 7. PUBLIC HEARING  regarding CDBG 2012 application. -- Mr. Miller (from INCOG) discussed the income survey letters that had been sent out to determine if Collinsville qualifies for CDBG grants. 74% return rate of surveys is required. The lileky local project will be for drainage and sewer improvements. 8. Discussion and possible action to adopt CDBG Resolution Number 2012-03. -- Approved, resolution to apply for the grant above ... competing with other local communities. 11. Discussion and possible action to close 13th Street from Main to the alley behind Library from 3:00 to 9:00 p.m. on June 16, 2012 for the Smithsonian traveling exhibit. -- Approved, Susan Babbitt described the 6-week "Key Ingredients" display (only 6 cities qualified to host in Oklahoma). June 16th is kickoff day with many events planned. 16. Discussion and possible action pertaining to FEMA Hazard Mitigation Grant federal funding in the amount of $35,303. -- Approved. The city will have to match about $10K. The previous plan was last updated about 5 years ago. 18. Discussion and possible action regarding 4th of July activities. -- Approved, with the event date set for Tuesday July 3rd and approval for the City Manager to approval required expenditures (limited by $10K cap and hoped for continued annual support from GRDA for the fireworks). * Bids out for park trail project. To be opened May 24th. Original bid request was modified for error in amount of concrete. * $5K grant approved (only one in Tulsa County) due to Collinsville Health Community status. A. Approval of May # 2 Payroll in the amount of $27,284.57. B. Approval of Claims in the amount of $244,479.26. D. Approval of Budget Supplemental in the amount of $220 for Collected State Building Code Fees-March 2012. * Ce,etery fence improvements being considered in budget plans. May be phased over multiple years for better quality fense facing highway 20.